My God, this has been a great year for power metal. 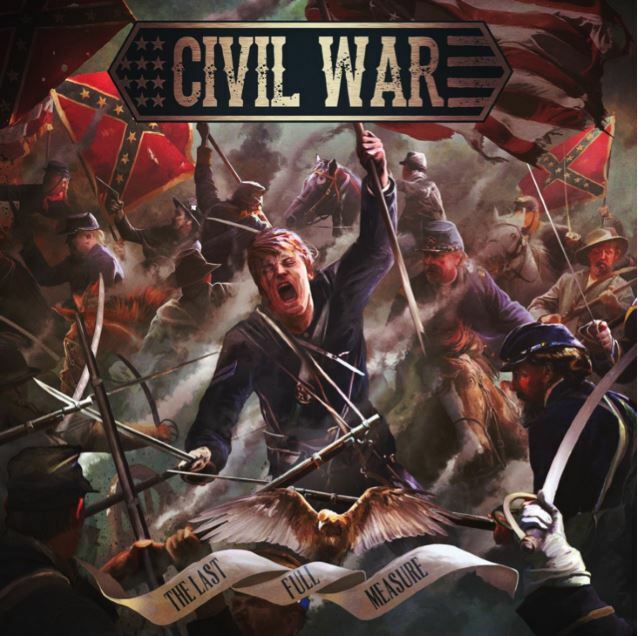 It’s been awhile since I’ve listened to Civil War, they’re a band that I’ve seen live and I think they’re a lot of fun. Mixing the traditional power metal formula with other musical ideas to make a new tone. So when I heard there was a new album on the way I was quite interesting. I’ve like their previous work so hopefully the new record The Last Full Measure works. Well I like this one. It’s definitely their sound. That heavy handed power metal with a noticeable twang that brands their signature. The grooves and riffs are fun and build to their respective choruses. These are usually pretty grandiose. The sheer presence that these guys have it great. Everything is full force, the songs don’t such worm their way in as the band beat the melodies in. Songs like A Tale That Should Never Be Told and Tombstone are brilliant tracks. They definitely hook in listeners for a fun ride. I can imagine getting pretty hyped during these songs at a concert. Although I have praised this album it has a few shortcomings. I will admit as much as I like some of the songs, this album was such a chore to get through. The album plateaus in intensity and there a lot of moments where I should be getting amped. Yet, I never get true satisfaction as the song has lost the luster. Gangs Of New York has this problem. I want to just love it but I get bored quite easily. This isn’t the best album. With the slew of great power metal this year. This album just gets lost in the shuffle and in my opinion doesn’t do enough to dig itself out. There are some great songs but the album as a whole is just OK. I’d recommend it if you’re interested. If you’re looking for something massive an album experience that sticks with you. Then maybe look somewhere else. It’s OK. This entry was posted on 10th November 2016 at 9:22 am and is filed under CD, Metal with tags Civil War, Napalm Records, Power Metal, the last full measure. You can follow any responses to this entry through the RSS 2.0 feed. You can leave a response, or trackback from your own site.